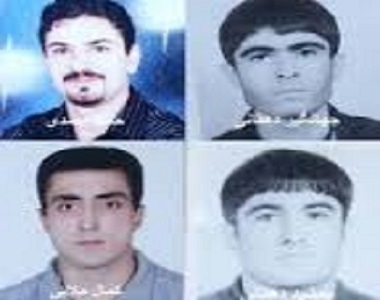 HRANA News Agency – Four Sunni-Kurdish prisoners of Ghezel-Hesar prison – Hamed Ahmadi, Kamal Molayi, Jamshid Dehghani, and Jahangir Dehghani – who have been on hunger strike since November, 4th , 2013 issued an statement with respect to the so-called “the week of Unity” and submitted a copy to HRANA. In this statement, the prisoners declared “we draw Iranian intellectuals’ attention to ourselves and to the young Sunni prisoners in the prisons of Kurdistan, West Azerbaijan, Sistan and Baluchistan, Gorgan, Ahwaz, Bandar Abbas, Kermanshah, Rajayee-Shahr, Evin and Ghezelhesar. We are examples of “unity” in Iran”. Hello; we would like to thank those who heard our voice of innocence and defended our rights. This statement shall serve as a report on the human rights situation of the Sunni prisoners in Iran and also a reminder to Iranian authorities about the “week of Unity” – alas there is no “unity”. Could we speak of “unity” when Shia clerics such as Akhound Bijan Daneshmand and Akhound Jouybari as well as Iranian Shia authorities and personas such as Ebrahim Hatamikia (in the 10th issue of the Green Magazine) have been repeatedly insulting Sunni’s believes? These are very minor examples of the systematic insult and harassment against Sunni community and religion in Iran. Surprisingly, none of these individuals have been questioned about their actions, instead they have been promoted to higher positions. In contrast, if Sunni minority peacefully protest against the suppression, insults, or violation of their rights, they will be put in jail with charges of “acting against God – Moharebeh”, terrorism, or collaboration with sectarian groups. We draw Iranian intellectuals’ attention to ourselves and to the young Sunni prisoners in the prisons of Kurdistan, West Azerbaijan, Sistan and Baluchistan, Gorgan, Ahwaz, Bandar Abbas, Kermanshah, Rajayee-Shahr, Evin and Ghezelhesar. We are examples of “unity” in Iran. We – four Sunni-Kurdish prisoners in Ghezel Hesar prison – are in 72nd day of our hunger strike and would like to provide a report on our situation. Over the last 14 months, we have endured a tough situation, and spent most of our time in dangerous narcotic section of the prison. Last year on December 12, 2012, we – 10 young Sunni political prisoners – sent a letter to the head of justice in Iran, asking for justice and fair trials. In response, six of us, named Asghar and Behnam Rahimi, Keyvan Zand-Karimi, Hoshyar Mohammadi, Bahram Mohammadi, and Mohamad Zaher Bahmani, were charged with “acting against God” or “drug trafficking” and executed on 28 December, 2012. Since then, we, the remaining four prisoners, have sent numerous letters, asking to resolve our problems. However, our letters have not been responded, and our situation has become much harder. We are now on hunger strike, not because we have lost our patience or faith in God’s will, but this is a mean of protest against the cruelty we and our families are facing. By staying on hunger strike, we are resisting against this oppression. Our requests are very simple and feasible: fair trial in public and in our cities and access to appropriate lawyer. Our dear bright people of Iran; we are innocent and haven’t committed any crime except for asking for respect to our faith and speaking out load about our believes. We are not afraid of execution, and we acknowledge that our death and life depends on God’s will. We are not the only individuals sentenced to death; there are more than 40 Kurdish Sunni individuals sentenced to death in unfair and private courts. We call on the Iranian government authorities and ask them to listen carefully to the voice of innocent people of Iran instead of speaking about the unfair situation of the people of other countries. If the government is talking about the brotherhood and week of unity, they should first respect and support this idea inside Iran. Unity should not be only applied to Shia majority or those who support the system. You should not imprison people who have different believes or religious background. You can’t resolve your problems with oppression and execution, and tyranny cannot persist for ever. You should hear the voice of oppressed people including children who have lost their parents, women who have lost their husbands or parents who have lost their children. Don’t misrepresent Islam with horrific executions; Islam is the religion of mercy and tolerance. You, who claim to be Imam Ali followers, look how he governed his people and why Imam Hussein started the Ashura uprising. We call on everybody, whoever hears our voice of innocence and understand the harsh situation that we are facing, to raise their voices and protest against this unjust action of Iranian government. We also thank those who have already supported our cause and continue supporting us.